For most of history, life has existed only in the global ocean (one, all connected), which makes up 99% of the living space on the planet. Every second breath we breathe comes from plankton. And if all land life were to die tomorrow, ocean life could survive. But if all ocean life were to die, land life — all of us — would also die. In 2009, it was reported that the pH balance (acidity) of the global ocean had become lower (more acidic) than it’s been for 65 MILLION YEARS, and that the protective shells of some of its base life have ALREADY become compromised. 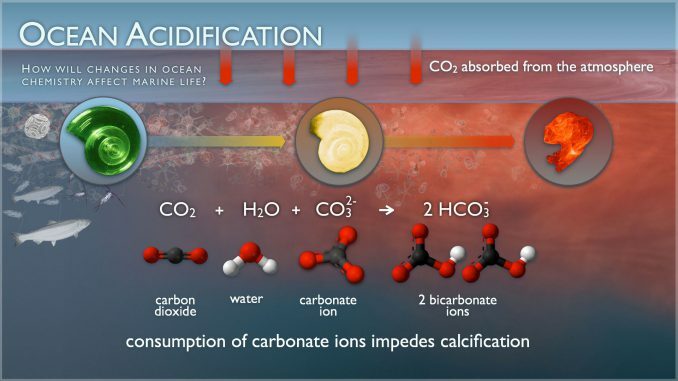 In 2013, a report concluded that oceans are at their fastest rate of acidification (from carbon emissions) in 300 MILLION YEARS, and that the process is in a state of, you guessed it, acceleration. Bottom line: The projected outcome of our current, carbon-intensive course is the potential collapse of ocean life — and the foundational base organisms that are an indespensible necessity for ALL LIFE to exist — within decades. No known individual or combination of Hail Mary geoengineering methods could address this, or save coral reefs, hotbeds of nurseries / habitat for 25-30% of all fish species / seafood / that evolved over millions of years / are relied upon for protein by 2.6 billion people and could be decimated by 2050. So it should be of considerable alarm that the (conservative) IPCC reports, upon which all international climate negotiations have been based and are limited to, did not even broach this threat until the most recent 2013/2014 (AR5) release. To deny this is to deny reality. But regardless of odds or potential outcomes, we ALL have the power and moral responsibility to ACT. And if we take the choice to see and face the wickednes of the predicament, there will at least be possibilities. GLOBAL EMERGENCY NOW: Mass base life die-off threatens survival of most life!